grubbus: Victrola: Best. 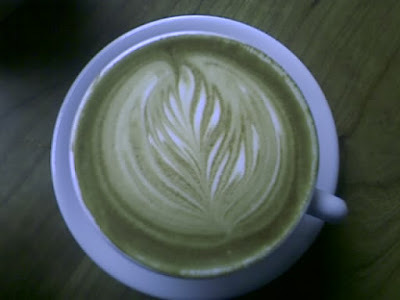 Latte. Ever. After years of waiting, patiently paging through posts at CoffeeGeek, mail ordering from Whole Latte Love, and daydreaming over the EspressoMap, I finally made it to Seattle. The Espresso Promised land. And let me tell you, Seattle did not disappoint. The restaurant we went to our first night there serves Espresso Vita from Vivace, and pulled a gorgeous, thick-crema ristretto. The run of the mill sandwich place on the first floor of our office building here has a 3 group Linea with Torrefazione Italia beans. And each floor of our office sports an impressive super automatic drip coffee machine that grinds per cup. Even with all that coffee goodness in the two block stretch between hotel and office, I still had to venture out. It'd be like going to Hawaii and avoiding the beach. World class espresso is based here, and I decided it was worth the walk. And after a bitterly cold, mostly up hill, mile-long trek through Seattle's downtown, I found Victrola. 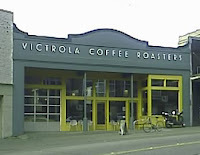 These guys are relative newcomers compared to David Schomer's gold-standard Espresso Vivace, but Victrola has a huge following, and is arguably the best cafe and roaster in the country. The place is airy and open - its beautiful, but not at all splashy. Compared to the bustle and snazz of Stumptown in Portland (another world class shop), Victrola is decidedly small scale. There's a single 2 group machine (granted, it's a Synesso), a couple of grinders, and a scattering of nondescript light wood tables set up on the concrete floor. Positively giddy and flushed, I got myself a double espresso. My own deep capacity for geekiness surprised even me, and a I had to stop myself from verbally oohing and aaahing at the pull. The double was very short - maybe an ounce - and it was a higher concentration of flavors than I can remember tasting in any coffee anywhere. The main taste is sharp and winey, but there are also lots of rich, almost woody flavors. There's even a tinge of sweetness at the first sip. It was clear by the end of the espresso that this would be phenomenal with milk, and good lord, it was. I went back to buy a small (8 oz) latte. It was a thing of beauty. 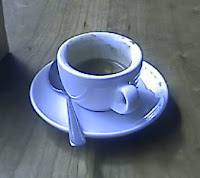 The sharpness of the espresso help up beautifully against the full sweetness of the milk. There wasn't a hit of bitterness and every flavor in the straight shot was there in the latte as well, only slightly muted and softened. I honestly can not imagine a better cup of coffee anywhere. It was perfect. It's refreshing to go out in search of the essence of a thing and not come away disappointed. I have family in Seattle so we head over there every once in a while. I'll DEFINITELY have to check this place out based on your recommendation. Thanks!